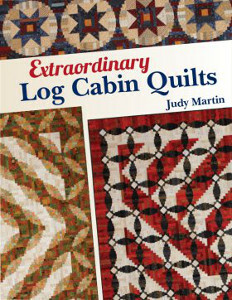 Judy Martin opens her fantastic pattern book Extraordinary Log Cabin Quilts with the words, "I do not have time to make quilts that do not speak to me ... I don't have time to make an ordinary quilt." That much is certainly apparent throughout Extraordinary Log Cabin Quilts, which provides clear-cut instruction for how to sew a log cabin quilt that is as memorable as its maker. Martin's book is predicated upon seven principles of sewing a log cabin quilt. First, she depends heavily on the use of scrap fabrics, which add nuance and personality to each quilt. All of the quilts in Extraordinary Log Cabin Quilts are made from scraps. Secondly, every quilt is finished with a clear border to add a finishing flourish. Thirdly, Martin uses almost exclusively narrow logs (just 1.5 inches wide) so that each quilt is engaging and unique. Martin's fourth principle is that big equals better, and therefore each quilt is meant for a queen or king size bed. Fifth, she points out the importance of playfulness in design. Each log cabin block is fresh and fun, so that every pattern can be re-used time and time again with unique results. Sixth, she places just as much emphasis on secondary patterns as primary, so that all aspects of the quilt are of equal caliber. And finally, Martin pays as much attention to color as she does to design; in her own words, an accent color "adds definition and complexity." Martin's book includes 20 pages at the front of pure reference material, answering any questions that you might have during the process of quilting. You won't find a more thorough, artistry-oriented pattern book!